You can find skates, boards and gear at your nearest big box store, but true skaters know to take their needs straight to the pros. Along with higher quality equipment from local skate shops, you get insight and advice from experts who are just as passionate about skating as you are. And you can’t put a price on that! Roll out to your next adventure at these 10 best skate shops in South Carolina. If there’s ever been a small business that’s also a superstore, Fuel is it. They offer everything for beginner and seasoned skaters, and the knowledge and experience to make it all work. 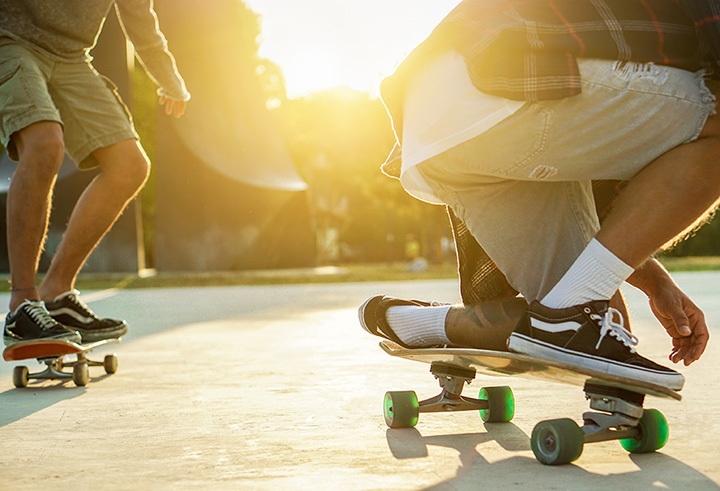 Aside from quality clothing, boards, and gear, they also offer skate lessons for those who want to learn a few new tricks. With an emphasis on skateboards and gear, Continuum carries all the top brands in shoes, like Vans and Adidas, as well as bearings, trucks, wheels, and boards to keep you rolling smoothly. The team at Bluetile Skateboards are all about helping fellow skaters as they pursue their passion for the sport. They feature their own exclusive Bluetile line of boards, accessories and apparel, along with all the components to keep your equipment in shape. Passionate about more than just skates, Blazer Skate & Motocross has created a one-stop shop for X Games enthusiasts. Here you can find a solid inventory of everything you need to enjoy skateboarding, biking, and snowboarding. If you’re new to the sport or need some extra advice, the experts here can explain everything you need to know to make a good equipment investment. Owned by Bo Mitchell of HBO’s “Eastbound and Down,” you can grab your gear from the shop and test it out at the onsite indoor skate park. They carry top name brands of apparel, shoes, and accessories. All skate parks should be so convenient as to have an onsite shop! Located at Red Beard Skate Park, this skate shop carries quality skateboards, along with hats, shoes, and shirts to complete the look. Locals rave about their experience here, as the team truly understands the art of skating and knows the right questions to ask to help match skaters to the right gear. For lovers of all the board sports, this is your paradise. You can find high quality paddleboards and surfboards for purchase or rent, along with custom skateboard creations to give your game a unique edge. They also carry top brands for wheels, trucks, and safety gear, and the elusive Carver and Island boards that redefine skateboarding as you know it. Parrot Surf and Skate combines the best of sidewalk and surf under one roof. Here you can find everything you need to show off your skateboarding skills. Bonus if you’ve snagged a yearly pass to Charleston County Skate Park—you get 10 percent off every skateboard item you buy! With the amazing free skate park in the heart of the city, it’s no wonder Salty’s Board Shop is nothing short of incredible. Here you can find the best skating and surf apparel and footwear brands, like Vans, Volcom, and Lightning Bolt, along with top notch boards and all the trimmings. A favorite among the local skating community, Inland Skate Shop offers not just the best skateboards around, but also the expertise that makes riders even more excited to pursue the sport. They work with skaters of all skill levels and ages to find the right boards and gear that will give them the best experience.